Sometimes I will hear someone describe an academic text with disdain, calling it “accessible” as if that were a terrible, embarrassing thing. This bothers me. Psychoanalytical, literary, political, and cultural theory are wonderful tools, but the texts from which this theory is drawn are often very difficult to read. Furthermore, academia has reached a point in its cycle of production at which it is simply not enough to have read the original sources of theory; one must also read all of the lenses through which they have been interpreted over the past thirty to forty years. As a result, even one strain of theoretical thought is often difficult to master. And yet, some scholars expect their readers to know everything about the specific theory that informs their work. They thus go about using specialist terms without explanation, throwing theorists’ names around metonymically, and not bothering to orient their reader to their underlying system of assumptions. I believe this is unreasonable, if only because some of us have not been alive for the requisite number of years it takes to read and study all the books (if such a thing is even possible). I don’t mean to suggest that all academics write like this. In fact, I believe most professors are far more interested in communicating ideas than they are in hoarding them within the confines of the ivory tower. Julia Bullock’s literary study The Other Women’s Lib is a perfect example, I think, of how an “accessible” academic text can convey both the pleasures of the authors whose works are examined and the pleasures of the methods used to examine them. In The Other Women’s Lib, Professor Bullock handles three postwar writers: Kōno Taeko, Takahashi Takako, and Kurahashi Yumiko. Each of these three writers is fairly canonized in the tradition of Japanese literary studies, with numerous dissertations and anthologized essays celebrating their work. Bullock’s book-length study is important because it has the courage to focus on these three female writers alone without feeling the need to include chapters on some of the more prominent male figures of the Japanese literary world, thus carrying on the torch sparked by classics like Victoria Vernon’s Daughters of the Moon and the fantastic essay collection The Woman’s Hand. Instead of dividing the book into three sections focusing on each of the three authors, Bullock has categorized her chapters thematically. Each of these five chapters deals with an important issue relevant to the work of all of the authors. For example, how were they received by the literary establishment? How did they incorporate the concept of the male gaze into their writing? Do their stories reflect an ingrained misogyny, or do they instead reproduce misogyny in order to challenge it? How do these authors narrate the female body? How do they characterize the relationships between women? Throughout these chapters, Bullock draws on the work of theorists such as Michel Foucault (the internalized gaze), Susan Gubar (feminist misogyny), and Luce Irigaray (the creation of discursive sexual difference). Bullock does not merely throw about concepts like panopticism, however; she explains her terms and their contexts and fleshes them out with well-chosen quotes before explaining exactly how they apply to the stories and novels she analyzes. The first chapter of the book, “Party Crashers and Poison Pens,” places these themes and writers into their geographical and historical context, namely, Japan in the sixties and seventies. These decades were an era of high economic growth and the cradle of gender ideologies that many people have now come to regard as “traditional;” i.e., the man goes out into the world and fights the good fight as a corporate warrior, while the woman stays at home and takes care of the children. The chapter introduces these ideologies and their political implications, explains their social and economic context, and then touches on the male-dominated literary scene before then demonstrating how certain proto-feminist women writers crashed the party with dark, violent, and absurdist fiction. 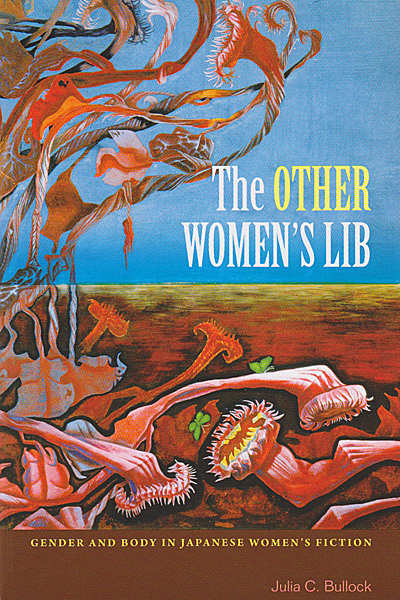 Bullock describes the literature that emerged during this period as “the other women’s lib,” a nuanced and intensely critical evaluation of contemporary gender roles and economic ideologies. Even if a reader has no interest in the particular writers in question, this chapter alone is worth reading for its excellent summary of an exciting literary movement and the dynamic and explosive time period that served as its background. That being said, Kōno, Takahashi, and Kurahashi are all fantastic writers who have been well served by their English translations, which appear in collections like Toddler-Hunting, Lonely Woman, and The Woman with the Flying Head. Their North American equivalents would be authors like Joyce Carol Oates, Alice Munro, and Margaret Atwood. In other words, they are authors who are worth reading and worth reading about. It is my hope that The Other Women’s Lib will encourage the popularity of these three Japanese authors in English-speaking teaching and translation communities. If nothing else, it is extraordinarily satisfying for me to put Professor Bullock’s book on my shelf next to all of the literary studies of Kyōka, Sōseki, Tanizaki, Kawabata, Mishima, and Murakami. As a bit of a footnote, I thought I might add that I don’t automatically bristle at the mention of theory. Theory, which is generally believed to be commonly shared between scholars, helps to offset extremely specialized academic inquiry, thus making a topic more instead of less accessible. Theory has the potential not only to broaden the treatment of a particular topic but also to deepen this treatment and make it more interesting and meaningful. A heavy-handed application of theory often renders a topic even more esoteric, however. This is not necessarily a bad thing – but neither is accessibility. Thus, Nina Cornyetz’s Dangerous Women, Deadly Words (which is quite heavy on theory) is an excellent book, but so is a book like Jane Caputi’s Goddesses and Monsters (which is more essay-ish and impressionistic). Also, I am aware that “ivory tower” is a hackneyed expression. I am beginning to think of the “condescending and closed to outsiders” stereotype of higher academia as not belonging to an “ivory tower” but rather to “The Department of Mysteries.” Surreptitious investigations into the nature of reality conducted by specialists in funny clothing behind closed doors, indeed. Theory that combines something (historical events, literature, art) with the theory is okay in my book! These decades were an era of high economic growth and the cradle of gender ideologies that many people have now come to regard as “traditional;” i.e., the man goes out into the world and fights the good fight as a corporate warrior, while the woman stays at home and takes care of the children. Context is SO important for understanding non-contemporary gender roles and how contemporary ones stem from/react to them. This book sounds amazing. I haven’t read any of the authors covered, yet, though–do you have a favorite book amongst their works? I like applied theory too, but some of it is perhaps applied too thickly. I would quote from Nina Cornyetz (PHALLOCENTRIC ECONOMY OF DESIRE) as an example, but I really respect her as a scholar, so I don’t want to make it seem as if I’m mocking her. It’s just that sometimes I have no idea what she’s saying. And she’s not even in the orange zone of my theory radar.